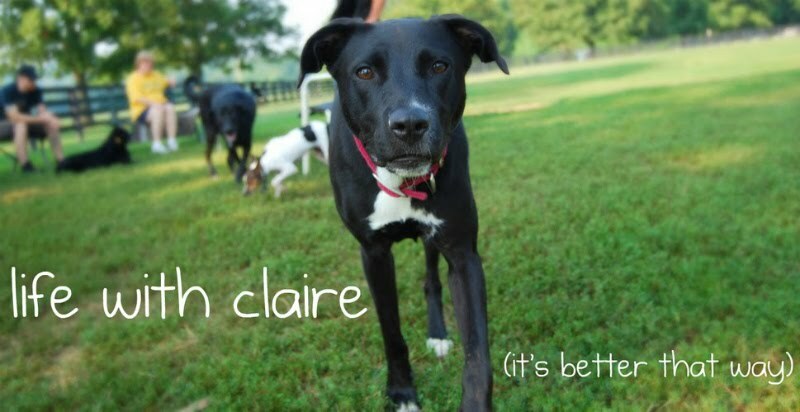 life with claire: a love letter to claire. a love letter to claire. It's been five years since I first went to the Nashville Humane Society and found you. Well, since you found me, really. You're the first friend I made in this city, and my life here (and in general) would be so different if we never met. Where did the past five years go?! We've been through a lot together during that time, both good times and bad. And while it's so wonderful to enjoy those good times together, I think it's even more of a blessing that you've been able to help me so much through the darker days. A stranger once told me that you're my guardian angel, and I have to say: I believe it! My favorite memory over the past five years is from last summer when we were back home. We got up really early and went down to the beach before the lifeguards showed up. You'd never been to the ocean before and, at first, you were a little afraid of the waves. Soon enough, you were running as fast as you could up the dunes and then back down past me to jump into the water. I remember that there was a landscaping crew hanging out in the parking lot, having breakfast before starting their day, and they came over just to watch you. When you were done running in circles (showing off again! ), you came over, covered in seaweed and sand, and jumped all over them. One of the guys said he'd never seen a happier dog. Not a day goes by where I'm not laughing at something you've done. You are silly and mischievous and curious and just so smart! You love to show off for people - whether there's something in it for you or not. You love having your tummy rubbed and you get annoyed if there are people nearby who aren't doing so. You are the best squirrel/rabbit/cat hunter around, and I dread the day that you bring one back to me (so please don't). You love walking the neighborhood kids to school in the morning and saying hello to everyone on our typical route. Running is one of your favorite things to do, and I love watching you zoom by with your little baby ears flapping in the wind! Chase is still your favorite dog to have play-dates with, and I've honestly never seen two dogs love each other more. You sleep the best on Grandma Sue's Pier One blanket (that she so kindly parted with on your behalf), and you never go to bed without bringing Lambie and Moosie with you. You love coming with me to run errands on Saturday mornings, mainly because the people at the stores we go to always have a special treat for you. Fetching anything except the peanut butter jar is still beneath you, no matter how many different kinds of balls or frisbees I try to entice you with. You enjoy watching the Food Network, but you're not such a fan of Animal Planet. You hate when I'm on the phone and will go to great lengths to get me to stop using it - like the time you wedged your face between my ear and the phone over and over again until I hung up from my conversation. Whenever someone comes to our house, you always think you're the reason they're there, and you bring your toys to them immediately - but just to show them, not to play with them. And there is nothing that makes you more excited than when I come home from work! Naturally, ClaireBear, I could go on and on. But the bottom line is: I love you more than anything! You are, by far, the biggest blessing in my life. I can't imagine spending my days without you, and I certainly don't want to! You are a huge part of our family, and even though you don't get to see your relatives very often, you can rest assured that they miss you and love you dearly. I know I say it a lot, but it's only because it's true: you are the MOST loved dog in the world!! Happy Gotcha Day, little one!